Cone-Beam CT is a fairly new imaging technology that produces 3-dimensional image data. Using a cone-shaped x-ray beam rather than the linear fan beam of conventional CT, a cone-beam CT scanner takes just one revolution around the patient to create multiple views. For example, in a dental setting, cone-beam CT can take images of both jaws in 3.6-6 seconds of actual exposure time. This represents significantly less radiation than one would receive with a full series of digital periapical radiographs, and is comparatively the same as bite-wing radiographs. With imaging software, the data may be reconstructed to provide 3D views that can easily be manipulated to show different angles, varying depths and thicknesses, and be selective for the particular tissues that need to be examined. The dose of radiation needed for a cone-beam CT scan is much lower than for a standard CT.
3D CT scans created from the cone-beam CT allow the surgeon and restorative dentist to best plan and place dental implants. Their uses and superior benefits are present throughout care, beginning with diagnosis to treatment and including post-op examinations. This can include: locating and determining the distance to vital anatomic structures; measuring alveolar bone width and visualizing bone contours; determining if a bone graft or sinus lift is needed; selecting the most suitable implant size and type; optimizing the implant location and angulation; increasing case acceptance; reducing surgery time and more. With the use of guided implant placement based on 3D cone-beam CT scans, all the above benefits are improved to the point that the surgeon can approach each case with the confidence that comes from knowing that the best available image data and technology have been used to guarantee success. X-Ray radiation exposure to the patient is up 10 times less than a standard CT scanner. Much faster scan time. Scans on a Cone-Beam CT take between 10-40 sec, while on a regular CT scanner, it takes a few minutes. Cheaper, as the average price of a Cone-Beam CT scan is up to 50% less than a conventional scan. 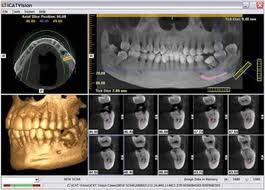 You can already find Cone-Beam CT's throughout the US at various imaging centers and in many dental offices. Any dentist can utilize the Cone-Beam CT technology through 3rd party image processing centers that read the CT and electronically convey the data to the treating dentist. The foremost eCommerce platform for all kinds of medical equipment, including Cone-Beam CT systems and other imaging equipment, MedWOW, has positively established its #1 position in the global imaging marketplace. MedWOW provides good-quality Cone-Beam CT systems in a safe and secure trading environment. When purchasing or selling a Cone-Beam CT, MedWOW can provide the market, the platform and the buyers, as well as a large variety of support services for both buyers and sellers. MedWOW has recently upgraded its medical equipment catalogue with various manufacturers, refurbished equipment and new and used Cone-Beam CT systems for medical and dental practices worldwide.